70 Years after WWII, there is a strong future for Jews in Germany. Young German Jews grow up with an inkling of the old prewar German-Jewish culture. German Jewish Life in Germany is welcome. In spite of that, something has been lost for good —but something new has been gained as well. How can one memorialize the past and live for the future at the same time? And how can Antisemitism in Germany be erased? Most German Jews who survived the Holocaust by escaping to Israel or the United States did not return to Germany after the war (read my story about German-Jews who fled to New York and my article in German about the Aufbau, the newspaper they founded in 1934). About 150,000 Jews survived the war in Germany; they were either too sick to make Aliyah to Israel, they were married to non-Jews or they were considered displayed persons (DP). About 1,700 Jews survived the war in Berlin, hidden by 20,000 to 30,000 German gentiles. Some German Jews chose to return to Germany after the war for political reasons: to build a better Germany; they mostly preferred to settle in Eastern Germany, in the Soviet sector, which was portrayed as antifascist. But the number of Jews left in Germany dwindled down to 10,000 a few years after the war. No one thought that the community would survive or could be revived. In the 1970s, the first larger Jewish immigration wave came through Germany from the then Soviet Union. They were on their way to Israel and the United States but many preferred to stay close to their culture. They were given German citizenship and the federal republic opened its doors to them. In 1989, 20,000 mostly Russian-born Jews lived in Germany. However, many of them, as the saying went, were nervously “sitting on their suitcases,” expecting to be forced at some point to emigrate again. In 2000, 30 rabbis served a Jewish community that had grown to number 120,000; only five of the rabbis spoke German and only two of them were under 50 years old. Jews living in Germany increasingly felt that the time had come “to unpack their suitcases,” as they were nearing the end of their lives. Alternative community groups started to form, and their grandchildren became more active in their communities. They started to refer to themselves as Germans. Today, ¾ of the German Jewish community are from the former Soviet Union and about half of them are not affiliated. The country experiences a renaissance in cultural and secular Judaism. 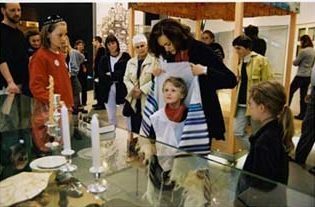 Many non-Jews consider conversion: At the Neue Synagoge in Berlin, 150 requests to convert to Judaism are registered annually, and the process is eased for people who have a Jewish father. The Jewish community, especially in Berlin, is very diverse and inclusive, much more so than before the war. In 2018, 200.000 Jews live in Germany. According to community leaders, “there definitely is a strong future for Jews in Germany.” And even though the intermarriage rate is very high, young German Jews do grow up with an inkling of the old prewar German-Jewish culture. In spite of that, something has been lost for good. But something new has been gained as well. Seventy years after Hitler’s ascendance and 60 years after the Holocaust, Germany is the one nation with the fastest-growing Jewish community in the world. Its active Jewish community has grown to 200.000 in 2018 (with another 70,000 applicants waiting for their papers from the former Soviet territories), from only 15,000 at the end of World War II and 30,000 at the end of the 1980s. Germany’s prewar Jewish community had numbered half a million. And in a milestone for Germany’s ever-expanding Jewish community, three new rabbis will be ordained at the Dresden Synagogue on September 13 and 14, 2006, as more Jews are moving to Germany than into any other country, Israel included. Up until now, 23 rabbis, educated mostly in the United States, Israel, and England, have led the estimated 200,000 Jews who make their home in Germany. 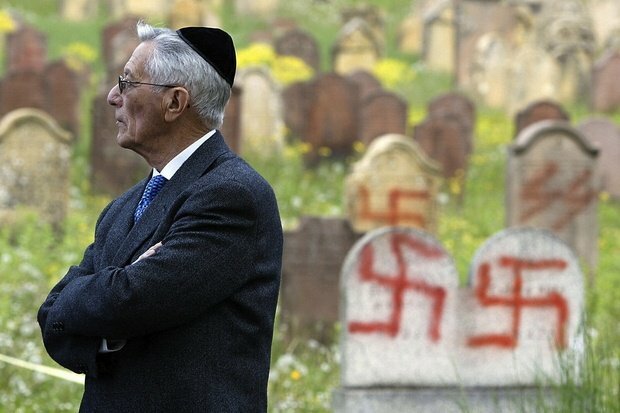 “Whatever the meaning,” claims the magazine, “a chance for atonement or victims’ revenge, Germany is home to Jews once more.” And The Economist wrote (May 2005), “Germany now has Europe’s third-largest Jewish population…. [Twice] as many Jews from the former Soviet republics settled in Germany as in Israel, bringing the total inflow to more than 200.000 since 1991. About half have joined a settled Jewish community, of which there are now more than 100, with a total of 100.000 members—up from 30.000 before unification.” Some German cities have seen a revival of Jewish culture, particularly Berlin that thousands of Israelis now call home. At least 10,000 Israelis are estimated to have moved to the German capital in the past decade, where it is now common to hear Hebrew. But many of them have parents and grandparents who are still refusing to visit Germany (Listen to an NPR podcast how Israelis are shaping Berlin’s culture). But can one actually speak of a “normalization” between Germans and Jews, and Germans and Israelis in particular? Not according to the German novelist Günter Grass. In addition to the many Russian Jews, who have been coming to Germany, thousands of Israelis, whose parents had fled to Palestine during the Nazi era, are now claiming German passports to which they are entitled by German law; the reason may be that they seek an escape route from the economic and political hardships in Israel. According to the German Embassy in Tel Aviv, in 2004 alone, 3,164 Israelis received German citizenship. More than 96% of those received their German passports under a law that automatically grants German-Jewish Holocaust survivors and their descendants the right to hold German citizenship. How many of those actually moved to Germany or another EU country is not known. A frank, yet painful dialogue between Germans, German Jews and Israelis has started. An honest public discourse is replacing Germany’s self-pitying sentimentalism, ceaseless self-criticism and underlying intellectual jealousy. Germans talk with, and about Jews with more ease; they have replaced palliated language with facts. Gone are the times, when they spoke of the Shtetl as a “vanished” place, rather than a place that was destroyed, and consequently adopted melancholic klezmer music as the sole representative of Jewish culture. Or when they spoke about Holocaust victims as if they went “like cattle to the gas chambers,” without facing up to the fact that Germany’s Jews were slaughtered by the Nazis—who were Germans, too. Coming to terms with history was made too easy in postwar Germany. The bad conscience was hastily appeased and patriotism was superseded by collective guilt. To avoid embarrassment, one never spoke freely to a Jew or an Israeli. Jews and Judaism were considered to be such sacral and symbol-laden subjects, better kept behind glass. One tried to avoid controversial subjects in public for fear of being labeled an anti-Semite, and society failed to acknowledge that deep-rooted anti-Semitism was still alive in Germany. Neo-Nazi parties were quickly banned, rather than dealt with publicly. Nazi and Neo-Nazi literature, symbols and artwork were ignored, rather than scrutinized and picked apart. And on the outside, it seemed that fascist and Nazi ideology had miraculously vanished with the arrival of the allies. But it did not. After the fall of the Berlin Wall, it became painfully clear that much work had yet to be done; memorials and museums, though laudable, wouldn’t erase old evils. Now that Germany’s Jewish community has grown, there is a real tangible partner for dialogue. These are not “Mitbürger” (“associate citizens”) or exotic fish swimming against the stream anymore—but Germans who happen to be Jewish. 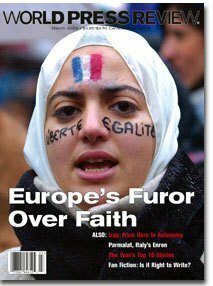 On January 27, 2003, a state treaty was signed between the German Government and the Central Council of Jews in Germany, stating that the Council would receive—as other religious communities in Germany do—a fixed sum of Euro 3 million as part of the federal budget. According to a 2003 survey by the American Jewish Committee on German attitudes toward Jews, 48 percent of the surveyed Germans expressed neutral feelings about Jews, 59 percent agreed that many people in Germany were afraid to express their true feelings about Jews, and 40 percent believed that now, as in the past, Jews exerted too much influence on world events. In addition, 45 percent agreed that money played a more important role for Jews than for other people. Seventy-nine percent of the surveyed Germans admitted that they personally didn’t know anyone who was Jewish. And as many as 60 percent of Germans say they are tired of being reminded of their country’s crimes against the Jews (The Economist, May 2005). Survey conducted by The American Jewish Committee on Antisemitism among refugees in Germany toward Jews (2017). 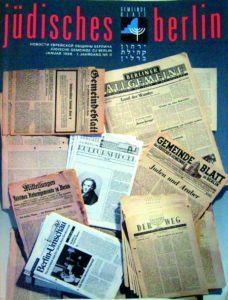 “Berlin-Judentum”, an English-language information portal on Jewish life in Berlin, compiled by hagalil.com. Book: Being Jewish in the New Germany, by Jeffrey M. Peck. 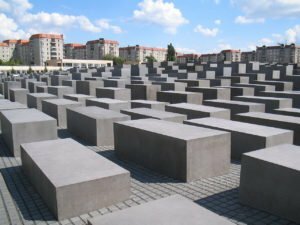 After 17 years of planning, Berlin finally built its long anticipated and fiercely debated Holocaust Memorial. It took some time, though. In November 2003, the construction of Berlin’s Holocaust memorial was temporarily halted, because it was discovered that Degussa—one of the many suppliers of construction materials for the memorial, specifically the paint that was used as primer for the pillars (see picture above)—was an affiliate of the now defunct company Dagesh that supplied the deadly Zyklon B poison gas to the concentration camps. This event marked a turning point in German-Jewish relations. The head of Berlin’s Jewish Community from 2001 to 2004, Alexander Brenner, spoke out against a continued involvement with Degussa. In the end, however, the board overruled his veto and decided on November 13, 2003, to go ahead with the construction as planned. The fact that the board had ruled against the wishes of Brenner and members of the Jewish community was seen as a sign. A positive sign that Germany, where most citizens were born after the war, was on its way to commemorate its past as it deems fitting. Many German-Jews and non-Jews alike applauded the board’s decisiveness; but there were also critics who lamented that the victims were denied their veto in a blatant lack of respect. 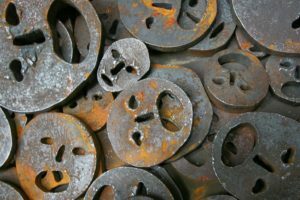 In the past, German Jews were regarded as the barometer on which Germany measured the treatment of sensitive issues related to the past and the Holocaust. Decisions regarding these “sensitive issues” were usually brought before the Jewish community, which gave them a “kosher stamp”. Or not. And if the community objected, its veto was accepted: German Jews were given a de-facto right to intervene only because of the fact that they were Jews. That was then. It might seem as too optimistic a view that Germany finally feels secure in its self-awareness toward the past. Has the battle cry “never forget!” become obsolete in a country where remembering the past is already so deeply ingrained? There are, of course, those who dispute this notion. Then there are others who feel that the country has earned full independence and maturity, which, in their eyes, is crucial to true reconciliation. This state of mind mirrors what the late chairman of the Central Council of Jews in Germany, Ignatz Bubis, had always hoped for: “The Federal Republic owes it to itself to [remember the past]. The memorial is a project of the Germans. German Jews don’t need it. “In December 2004, the last of the 2,751 concrete blocks was put in place, completing the construction of the memorial above ground. It was officially opened by Chancellor Gerhard Schröder on May 10, 2005. 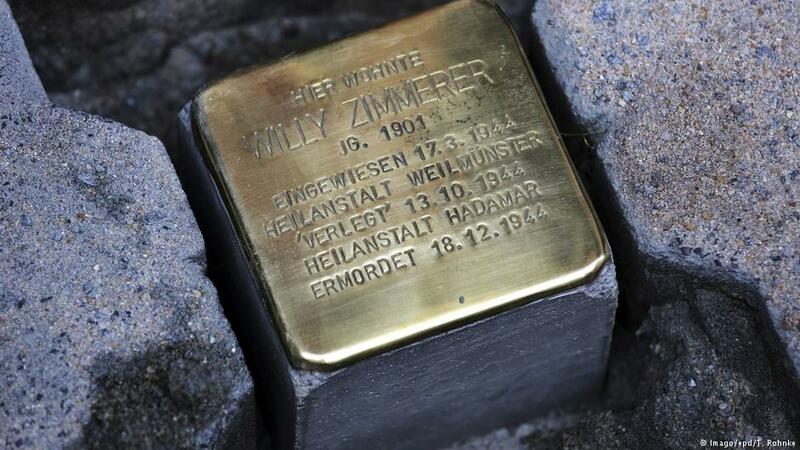 The 70,000th Stolperstein, dedicated to Willy Zimmerer, who lived near Frankfurt. Project Stolpersteine (stumbling blocks) is an initiative that remembers German Jews who were deported from German cities and killed in the Holocaust. This art project was launched in 1995 by the German Cologne-based painter Gunter Demnig, who places commemorative brass plaques among the pavement stones in front of buildings, embossed with the dates of residence and the name of the person who lived there before being deported to a concentration or labor camp. The first 50 stones were placed in Berlin in 1996, in what was then an illegal initiative. By now, however, more than 7,000 stumbling blocks have been placed in Berlin alone, with the blessing of the city’s government—and more than 60,000 stones have been dedicated overall, many of them in other parts of Europe. 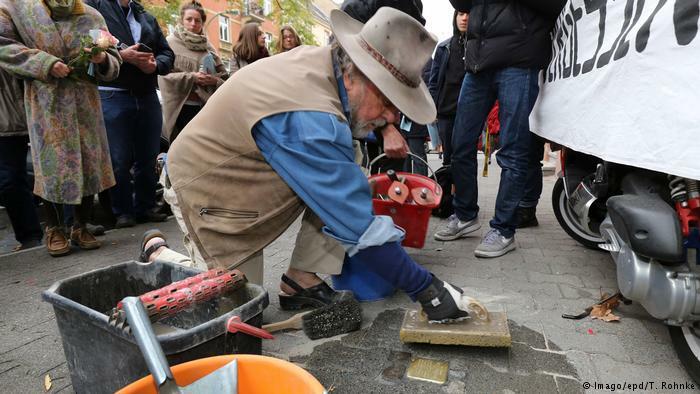 Gunter Demnig places a Stolperstein near Frankfurt, Germany. Each stone represents one name, one place and begins with “Here lived….”, according to a saying in the Talmud: “A person is only forgotten when his or her name is forgotten”. Since 2005, each Stolperstein has been made by hand by the sculptor Michael Friedrichs-Friedländer in his studio outside Berlin. Demnig still installs most of the stoners himself, and is “booked” a year in advance. After placement of each stone, a small ceremony, sometimes in attendance of family members, is held. For about € 120, anyone can sponsor a stone, and volunteers regularly polish them (see video below). Please contact info@stolpersteine.eu for more information. 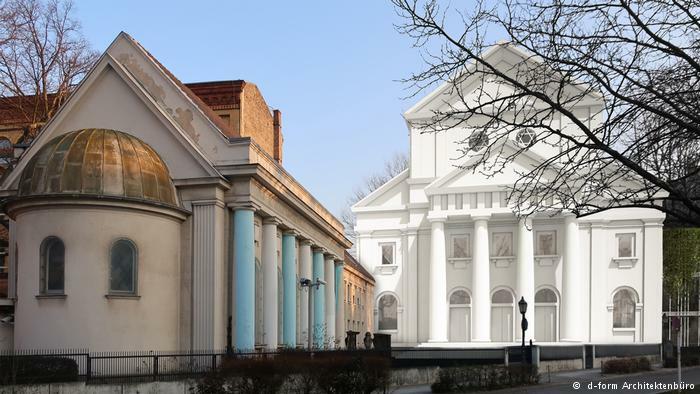 In 2018, it was announced that for the first time in Germany, a synagogue that was destroyed during Kristallnacht in 1938, the Synagoge am Landwehrkanal or Fränkelufer Synagoge, could be fully reconstructed and rebuild again—in the midst of Berlin’s district Kreuzberg that has a large Muslim population. And its leaders have endorsed the plan. The daughter of the building’s original architect Alexander Beer, Beate Hammett, lives in Sydney and heard about the plan from a relative who had read about the initiative in an Australian newspaper. She returned to Berlin for the first time to the place where she grew up and where the synagogue once stood and wholeheartedly endorses the project. If all funds can be collected in time, the reconstruction of the synagogue is scheduled to be finished in time for the 85th anniversary of Kristallnacht, in 2023. On May 10, 2005, on the 60th anniversary of Germany’s capitulation and the end of World War II, Berlin’s Holocaust Memorial, the largest of its kind in the world, was inaugurated. In the first year since its opening, 3.5 million people have visited the memorial and it has become one of Berlin’s largest tourist magnets. The visitor, who alone chooses which way to cross the huge undulating plain, gets lost among the pillars, and the memorial is meant to evoke a feeling of loneliness and unease. This memorial demands from its visitors to think for themselves. They are not taken by the hand, force-fed with guilt and released cleansed. The monument is made up of 2,711 concrete pillars in different heights, suggestive of tombstones or a huge wheat field, rippled by the wind. What makes this memorial special is that it is not trying to be nice, to be pleasant to the eye, easy to grasp, a man-made tranquil place to drop off flower bouquets—and then to move on. This is a memorial where people can reflect, but it is also a place where children will play hide and seek, where young people will skateboard or where someone will spray paint swastikas on the pillars. Some people cringe at the thought that the memorial will be desecrated. But I believe that would only bring out into the open what was already simmering below the surface: prejudice, hatred—but compassion and solidarity as well. This is a memorial in the heart of a city, and it will be “lived in” accordingly. It will adjust itself to its surroundings and it will change those who will study it closely. It can become a gathering place; it can become a symbol of freedom of speech. There will continue to be a lively debate in favor and against the monument. The more, the better. Nothing could serve its purpose better: Because that proves that this monument is not just a kitschy fixture that you pass daily, yet never notice. As Peter Eisenman, the architect, once said: If everyone were to love the monument, it would mean it hasn’t fulfilled its purpose. 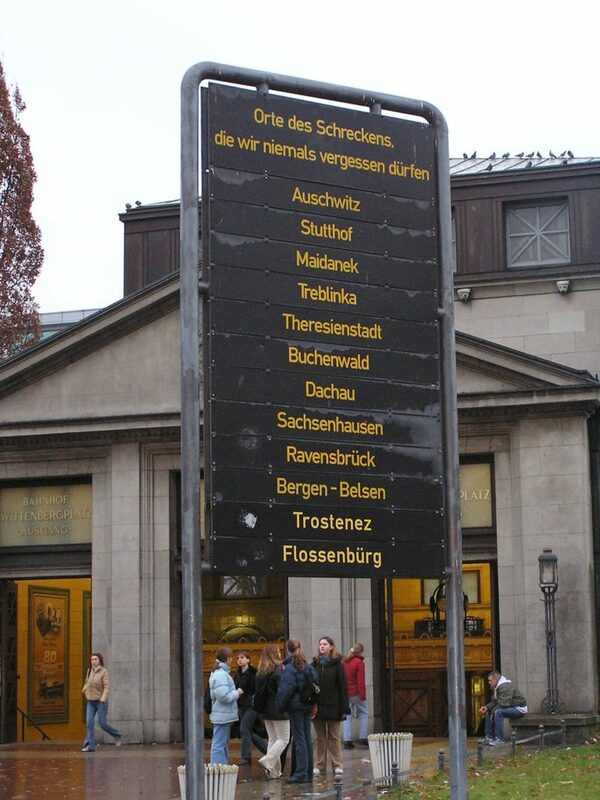 Likewise, the memorial can only work in conjunction with the preservation of all the remaining authentic places, where the murder of the European Jews did actually take place: the concentration camps, the labor camps, the extermination camps, the ramps and the train stations, from where they were all sent to their death. A movie by a young Swiss-born Jewish movie director in 2004 had started it: Jewish humor is increasingly seen as acceptable again in Germany. But it is a laughing with, not at Jews, that makes it possible. Not surprisingly, Jewish Humor in Germany is different. 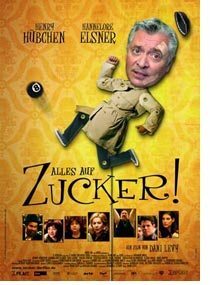 The first German-language movie that took a comic look at Jews in Germany came out only in 2004. Dani Levi’s “Alles Auf Zucker” (“Go For Zucker!”) took an openly sarcastic, self-mocking look at one very dysfunctional Jewish family in Germany and with it Jewish rituals in general, while portraying a deep affection for them as well. This was the first time in postwar Germany that Jews laughed about themselves in German cinema. Up until then, only Jewish comedians from America, like Woody Allen or Jerry Seinfeld, were considered legitimate comical fodder, who were allowed to stress clichés about Jews and Jewish life as part of their shtick. Americans approached the subject maybe with less restraint—but with tremendous honesty and respect. Now, German cinema discovers this easygoing symbiosis for itself. No longer are Jews and Germans depicted solely in their historical relationship and in context with the Holocaust. “Alles Auf Zucker” was an enormous hit in Germany, where it won many prizes and was widely hailed as the beginning of a renaissance in German-Jewish humor. After a careful prescreening, it was shown in Israel to mixed, but mostly favorable reviews. But was the German outpouring to the movie genuine? The renowned German Literary Magazine Literaturen wrote in its July/August 2009 special issues on literature in America that times might indeed be changing in Germany. One side effect, however, is the now widely-held notion that Jews and Jewish Humor are always brilliant, infiltrated by an age-old wisdom, which therefore must be present in every Jewish artistic expression, from literature to movies to TV shows. Jewish, and especially Yiddish humor, is hailed as a leftover feel good part of the past, together with klezmer music and Shtetl romantic, to be consumed with one crying and one laughing eye. But isn’t that presumptuous from the Germans? There is a difference between easily digestible art and shallow art, as there is between Jewish jokes and joking about Jews. And Germany is now legitimately trying to figure that out for herself. 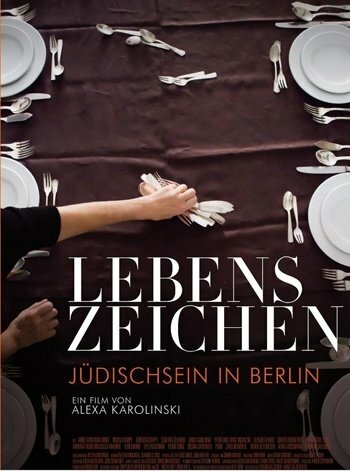 In 2018, another movie, and not a comedy, made headlines in Germany, “Signs of Life—Being Jewish in Berlin” (Lebenszeichen—Jüdischsein in Berlin) by Alexa Karolinski. Alexa is a member of the 3rd generation of German Jews, who grew up in Germany decades after the Holocaust. Her approach to what it means to be Jewish in Germany is a search for what this 3rd generation even stands for. Their grandparents tried to repress their first-hand memories in order to rebuild their lives in post-war Germany and survive the traumas and losses they faced; their parents lived with the distant shadows and fears of the Holocaust that was never explained to them by their parents; and the third generation, the grandchildren of Holocaust survivors, are now splintered into what Alexa calls many smaller subdivisions: German-Jewish, post-GDR, post-soviet Jewry, post-Israeli, pre-immigration wave. Alexa’s film follows these individuals and asks how they define being a German Jew living in Berlin today, 70 years after Kristallnacht. Whereas Alles auf Zucker introduced for the first time laughter and comedy into the German-Jewish dialogue, Lebenszeichen is a deeply personal essay into the contradictions of being Jewish in Germany today, living as 3rd generation Jews in a society that cannot be as easily defined anymore. It is not an “us against them” reality any longer that explains German-Jewish realities, but rather a feeling of many “thems” at work, one of them being Jewish, that define German society as a whole today. And Antisemitism, for once, is not a focus. Rather, the movie unravels the intimate, deeply personal reflections of young German Jews, who ponder for themselves why, where and ultimately how they belong. 50+ Years German-Israeli Diplomatic Relations—and all is well. The diplomatic relations between Israel and Germany are strong, much stronger than the bond between Germans and American Jews. But tensions with Israel over Germany’s relations and its solidarity with the Palestinians are growing. The relationship between the two countries is rooted mainly in history, in the past and less in the present or future. Diplomatic relations between the two countries were officially established on May 12, 1965. The ground for that was paved by Chancellor Konrad Adenauer and Prime Minister David Ben Gurion in the 1950s, long before the public in both countries were ready for any kind of normalization. In 1951, a reparations agreement was signed between the two countries, after Adenauer spoke in Parliament about “German guilt and the responsibility of moral and material restitution,” and he promised that Germany would assist the young State of Israel in any way it could. Only 11% of Germans agreed, however. In 2008, Chancellor Angela Merkel gave a moving speech in German, which she started in Hebrew (transcript and video) in the Knesset in Jerusalem, a first for a German Chancellor, and she received a standing ovation at the conclusion of her speech (while there were also many seats left empty in protest). “Your visit is an important step in the tightening relations between Jerusalem and Berlin, in what many would consider beating the odds,” added the Knesset speaker. Years earlier, in February 2000, German President Johannes Rau was the first German president to hold his remarkable speech in German before the Knesset (transcript). And in 1996, Israel’s President Ezer Weizman gave a very moving speech in the German Parliament (then still in Bonn) in Hebrew—and in celebration of Hebrew. Today, Germany is Israel third largest trading partner, while Israel is the second largest trading partner that Germany has in the Middle East. The German-Jewish community in Berlin has called the relationship between both countries “a success story.” But it questions if this sentiment is shared by the vast majority of Germans. 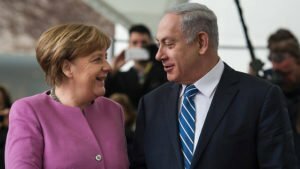 Still, German officials feel that Israelis—especially Israeli politicians—often take Germany’s loyalty and solidarity for granted and don’t even try to improve this unique relationship. According to Yediot Acharonot, when Ariel Sharon was Prime Minister of Israel, he twice canceled a visit to Berlin at the last moment. Many Israeli politicians don’t even think of scheduling a stopover in Berlin on their way to the United States, and only few of them met with German parliamentarians who recently visited Jerusalem. You Don’t Like Israel? Who Cares! Until not long ago, it was politically incorrect to criticize Israel in Germany. Now, many decades after the establishment of official German-Israeli relations, that has changed. Germany and Israel have had a long and painful period of reconciliation, but their diplomatic relationship has deepened over the years. In that spirit, Israel’s then-prime minister Ehud Barak was the first foreign dignitary who in September 1999 paid a visit to the newly reconstructed German Parliament in the former Reichstag building in Berlin. Later, German Chancellor Gerhard Schröder and Barak attended a memorial service in Sachsenhausen concentration camp. During this visit, for the first time in history, Israeli soldiers formed a military honor guard, side by side with German soldiers, on German soil. 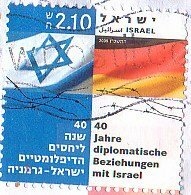 The political, cultural and economic ties are strong: An increasing number of Israelis (498 in January 2002, double the number of the entire year before) have applied for German citizenship, just in case the situation in the Middle East gets out of hand and they will need to get out. According to Der Spiegel (June 2018), 11.000 Israelis live in Berlin. Jürgen Möllemann, the former deputy head of Germany’s liberal party FDP and chairman of the German-Arab Association, who died June 5, 2003, in what was believed to be a suicide, was an increasingly vocal and not very compassionate critic of Israel. There is good and bad in this development. The good news is that earnest, well-founded criticism is healthy and two partners have to be frank with each other, even to the point when old clichés surface, as when Möllemann attacked the “Jewish” character of Michel Friedman, vice president of the Central Council of Jews in Germany, and suggested Israel and the Jews should have learned better from their near extinction during the Holocaust. The public debate that ensued was refreshing; it brought into the open what really should be cause for alarm: namely that underlying anti-Semitic feelings in Germany are all too easily painted over with anti-Israel or anti-Zionist remarks. It broke long-held taboos, pushed people to take a stance, to rethink loyalties. The public outcry let FDP leader Guido Westerwelle, after much hesitation, to offer some level of damage control. But this kind of political discourse should not be turned into an element of calculation in the political parties’ run-up to September’s general elections; it shouldn’t be considered a political commodity and platform for prejudices. A politician should be frank, but cautious. You don’t like Israel? So what! Just play it fair. The public, however, should stay alert, because a politician holds a position of power. But what about an artist? Do the same rules apply to him or her as well? Renowned German writer Martin Walser, who has shown time and again a pitiful lack of tact and manners toward Jews, was at it again. One of his books features the murder of a Jew, who readers recognize as Germany’s famous literary critic, Marcel Reich-Ranicki, a Jew. Walser’s book was labeled hateful and anti-Semitic. I believe an artist has more leeway than a politician, who is a publicly elected representative. If Italians or French can be “killed off” in a novel, why not a Jew? The book is either bad or good on its literary merits. If it is indeed anti-Semitic, somebody should write a better book that counters it. Artists reflect reality. If there is still a hint of anti-Semitism in Germany, German literature will reflect that as well. However, if the book were considered anti-Semitic propaganda per se, which is an entirely different matter, wouldn’t it be interesting to see how many people actually admit to having read it? Germans shouldn’t fear controversy, because the German democracy is stable, has many checks and balances in place and the public is alert. But this constant public discourse is demanding: it requires devotion, honesty and courage. Stay clear of complacency. Anti-Semitism is in decline globally, according to a 2017 Global Survey that was conducted by the Anti-Defamation League in New York . That was not always the case. Only a decade ago, Anti-Semitic attacks seemed on the rise in Germany. A German rabbi once even went so far as to advise his brethren not to display signs of their faith, like skullcaps and necklaces with the Star of David, for fear of being attacked, following two street assaults on Jews in Berlin. Many of the anti-semitic attacks were, and are still, political and not racist by nature, which doesn’t make them less severe. But regardless, any anti-semitic and xenophobic attack has to be fought with more than just good intentions. People have to speak out openly against hate, protect those who need protection. The number of anti-Semitic incidents was on the rise in 2017. According to the German Ministry of Interior, 94% of the attackers came from right-wing fractions. In Berlin alone, 947 anti-Semitic attacks were registered in 2017, according to RIAS (Research and Information on Anti-Semitism). But according to a poll conducted in June 2018 by Allensbach, more than a fifth of respondents said that Jews were “greedy”. That said, the pollsters concluded that “Anti-Semitism has declined in Germany,” even though old, stubborn prejudices remain steadfast in parts of the society. It does not, however, amount to open and widespread hatred against Jews, which only a very small minority adopt. And at least for now, anti-Islam prejudices are much more prevalent than Anti-Semitism, according to the poll. 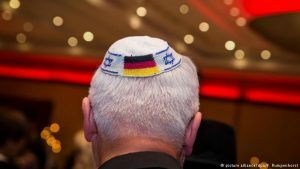 In April 2018, after attacks on Jews in Berlin by two Syrian asylum seekers, the head of the Jewish Community Josef Schuster advised German Jews not to wear kippot in public. 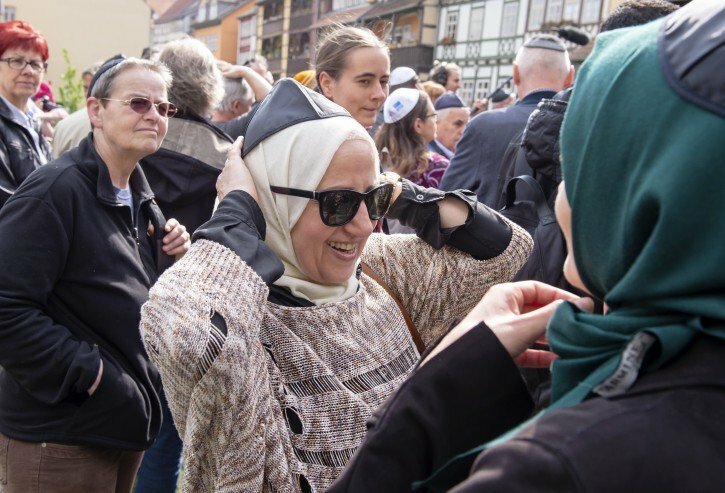 As the Associated Press reported, Germans took to the streets to voice their solidarity with Jews and their outrage against Anti-Semitism by wearing yarmulkes en masse. Chancellor Angela Merkel had condemned the attacks in a public statement as well. In Berlin, there were 947 antisemitic attacks in 2017. “Berlin Wears Kippa” Protest, April 2018. I am against prohibiting right-wing parties, because only if they’re out in the open can we fight them. We have to see our enemy in the face, speak out and show integrity, as Germans did with their protest. In the summer of 2018, the state of Berlin announced that each anti-Semitic attack in schools, including bullying, would now be entered into a central database in order to be able to statistically document and show its prevalence in German schools. Starting with the 2019/2020 school year, antisemitic attacks will be assigned their own category within anti hate crime databases and school officials are required to report each attack to Berlin’s senate administration and police authorities. Because the reporting of anti-Semitic incidents in schools has not been mandatory to date, the exact numbers are hard to assess—but they are rising. “Harassment that’s ‘unconstitutional’ is already required to be reported, but the explicit mention of anti-Semitism is intended to raise awareness of the problem in schools and provide concrete figures on incidents”, says Senate speaker Beate Stoffers. The decision follows the case of a Jewish boy at an elite school in Berlin’s Zehlendorf district. The ninth-grader had reportedly been bullied and threatened by his classmates for months. He has left the school. The German-Jewish relationship needs to build on the future, the living, without dismissing the past. Young Christian Germans and young German Jews will have to talk to get acquainted. Not everything is black and white. German-Jewish dialogue has to focus increasingly on the young generation from both sides. The younger generation is the future. We have to make sure that they are not driven anymore by the burdens of the past when dealing with each other. To their advantage, their connotations with history are different from the ones of their parents. The younger generation in Germany and in Israel is able to interact more easily with each other. With the increasing Jewish population in Germany, young Germans have now finally the chance to face Jews and Judaism more often and more naturally, without fear, shame or embarrassment. 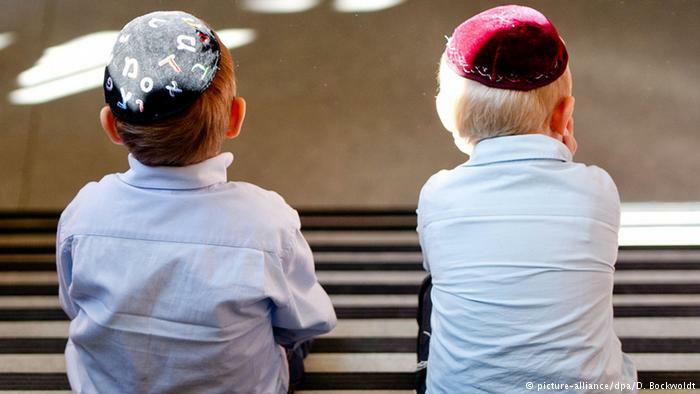 Even so, many young Germans still encounter Jews and Judaism mostly—and too often, only—through history lessons in school, where Jews and Judaism are mentioned only in the context of the Holocaust and victimhood. Most pupils never meet, let alone, talk to a Jew of their age. Only when a Jew becomes a classmate and a friend, or even an enemy, can normalcy begin. An effort to understand one another was made by the Kaufmann-Marx Foundation, a nonprofit foundation that was based in New York, which encouraged young Germans to understand American Jews. The foundation published booklets for use in history classes in German schools that brought the stories of young Jewish Americans, their fears and hopes, to the pupils. My essay Sprache als Brücke—Die Zukunft von Geschichte (in German), appeared in one of those booklets. In a language that teenagers can relate to, I tried to convey my thoughts concerning the power of words. I deal with words, and I am aware that a word can be misused as a weapon. How much foreign culture are Germans willing to absorb without losing their identity? Anything “Jewish” goes and is willingly embraced—but what about the religious and cultural identity of other minorities? In dealing with issues concerning Germany’s 3.5 million Muslims, many Christian Germans are still very reluctant to accept the unknown in their midst. And the German media eagerly mirror the debate. Take for example Fereshta Ludin, an Afghan-born Muslim teacher in southern Germany, who has fought a five-year legal battle over her right to wear her headscarf (hijab) in school. 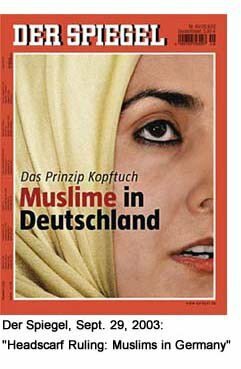 On Sept. 24, 2003, the German Federal Constitutional Court finally ruled that she was entitled to wear her hijab in class. But the ruling, “one of the greatest challenges for the German jurisdiction” (Der Spiegel, Sept. 29), left it to Germany’s 16 states to decide if, and how, to enforce the law. Seven states have already declared that they would not allow the hijab in their schools. Several European countries have already struggled with similar dilemmas. Judging from the media’s reactions in Germany, however, the fiercely debated “patchwork of headscarf rulings,” as it is referred to, has a far greater significance and historic meaning in a country hardly known for its racial and cultural diversity. Commentators were deeply divided among those who consider the hijab a symbol of gender oppression that has no place in German schools, those who want to maintain the separation between church and state, and those who accept religious symbols as an integral part of a multicultural, open society where the individual rights and personal beliefs of at least 3.2 million Muslims ought to be respected (pictured the March 2003 issue of World Press Review, whose cover story included reactions from the European press on the so-called “Headscarf Debate”). Margrit Gerste, writing in the same paper (Sept. 25), didn’t go that far but basically agreed: “An open, liberal multicultural society depends on neutrality. Therefore: No headscarf, please!” And Der Spiegel, in its 14-page cover story (Sept. 29), remarked bluntly: “The Muslim teacher asked for tolerance in the name of intolerance….To tolerate the hijab would mean to underestimate the aggressive craving for legitimacy of fundamentalism. It has to be stopped before it turns violent….The oppression of girls is now manifested by law.” The article gave the impression that wearing the hijab would eventually lead to terror, ignoring millions of peaceful religious Muslims. Official Ruling of The Federal Constitutional Court 2004 (Bundesverfassungsgericht) 2 BvR 1436/02 and the official press release from 2003. Texts are in German.